Film takes No. 1 spot from "Zombieland"
Vince Vaughn and Jon Favreau have buddied up again to land their relationship comedy "Couples Retreat" at the top of the weekend box office. The movie pulled in $35.3 million to take over the No. 1 spot from "Zombieland," the horror comedy that slipped to second place with $15 million. 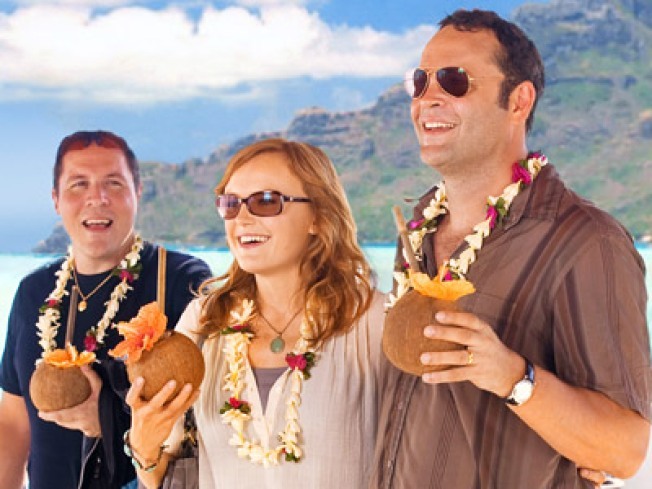 "Couples Retreat" features "Swingers" co-stars Vaughn and Favreau in the tale of four couples at an island therapy resort. The micro-budgeted fright flick "Paranormal Activity" did big business in its first full weekend after two weeks of midnight-only screenings. "Paranormal Activity" came in at No. 4 with $7.1 million in just 160 cinemas, a fraction of the theater count for other top releases. The movie was shot for just $15,000.